The Designer's Notebook News: Game Mechanics: Advanced Game Design has been published! Game Mechanics: Advanced Game Design has been published! Joris Dormans and I are proud to announce the publication of our new book, Game Mechanics: Advanced Game Design. Game mechanics are the hardest aspect of game design to talk about and to teach. Because mechanics create gameplay, they are at the heart of all games, but they aren't flashy like character or level design, nor creative in the way that storytelling is. We have no common vocabulary for them, and they're hard to visualize. Our book aims to change all that. People who know me well know that I'm not fond of hype, but I genuinely believe this book could revolutionize the way we teach game design and maybe even the way we do it in the game industry. Really. I'm certainly changing the way I do. Starting with some ideas in my earlier book, Fundamentals of Game Design, Joris Dormans created a visual language for diagramming game mechanics, and best of all, a free tool for drawing them and simulating them in real time. It's called Machinations, and the moment I saw it I knew that we had to write a book together. Machinations lets you visualize your ideas and test them instantly, without a single line of code. No fiddling with Excel. Just drag, drop, and run. We show how to use it, step by step. Our book discusses how to prototype and tune mechanics. How to turn fixed, scripted progression into emergent systems. How to use random numbers. How to integrate mechanics design with level design. How to give meaning to mechanics in non-entertainment ("serious") contexts, and much more. As well as making use of the Machinations Tool, we also introduce a library of design patterns that gives a name and above all an operational diagram of each pattern. The library includes categories for engines of growth, friction, and escalation, plus additional mechanisms that create stability cycles, arms races, trading systems, and many others. 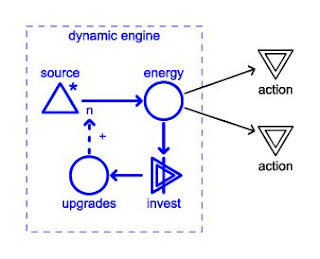 The Dynamic Engine pattern shown in the Machinations visual framework, demonstrating how investing an engine's output in upgrades improves its productivity -- a classic positive feedback loop. This is one simple example of hundreds in the book. New Riders (our publisher's) page for the book. A free sample chapter (chapter 4, Internal Economy) in PDF format. University professors, order a free exam copy here. My own web page about Game Mechanics, which includes a detailed table of contents.